When you thing of the auto industry, you likely focus on big players like Ford, General Motors, Toyota and Mercedes. Names like Magna International and Denso may not mean a whole lot to you. But you should know those names. They likely make more of your car than you realize. “Mega suppliers” like Magna and Denso have been growing for years and in the process have been sifting the balance of power in the industry (Age of mega supplier heralds danger for carmakers, Financial Times, May 18). 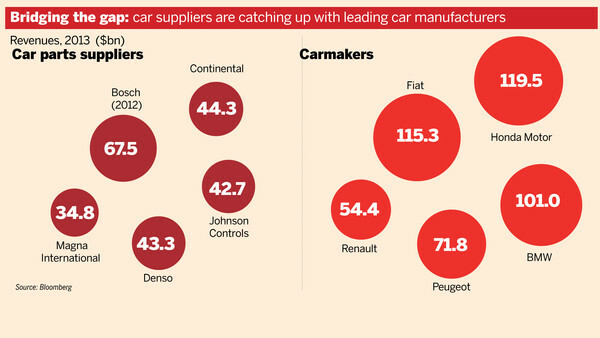 There are now 16 major car manufacturers that sell more than 1m vehicles a year. But those cars are built from parts supplied by just 10 major component makers – meaning that under the individually styled bodywork, cars are sharing more parts. Bosch, the world’s largest automotive supplier by revenue, reckons that at least one of its parts is built into almost every new car sold anywhere in the world – regardless of brand, market, price point or geography. The article goes on to note that the top ten suppliers capture 60% of the revenue generated by the top 100 suppliers. Given this situation, two questions seem relevant. First, how did automakers find themselves in this situation? Second, what are the implications for how the industry functions? Part of this has to do with some shifts in what consumers want in cars. People still choose based on traditional features like appearance and engine performance but additional bells and whistles like navigation systems or entertainment systems also matter. Car makers want to be able to access best-in-class systems and not necessarily be tied to in-house systems. For the traditional US Big Three, being tied to in-house systems was complicated by union contracts. Their component building units (now largely spun off) were unionized with contracts that gave the in-house suppliers a leg up in bidding on things like brake systems. Shedding all that let, say, Cadillac buy its brake systems from whoever had the current best offering. Further, that supplier could have scale for its high-end system that GM could never hope to achieve unless it was willing to sacrifice some of the distinctiveness of Cadillac by putting super high-tech brakes into Buicks. It should be noted that this quest for scale led to many questionable auto deals back in the 90s. Daimler merging with Chrysler, BMW buying Rover, Ford and GM hoovering up random European brands like Saab and Aston Martin were justified in part by a belief that successful automakers would need to be really, Really BIG to justify developing necessary technology. Today a firm like, say, BMW can be successful producing only two brands while relying on suppliers to push the envelope on various kinds of components. So what does this mean for the industry? For one, it means that parts makers can capture more of the pie. Operating margins at the world’s 10 largest automotive suppliers are on average 4 percentage points higher than those of the 10 largest carmakers, according to Strategy&. Continental, the world’s second-largest car part supplier by revenue, recorded an earnings before interest and tax margin of 9.8 per cent last year. Carmakers General Motors and Fiat, two of Continental’s biggest customers, reported margins of 5.5 per cent and 3.4 per cent respectively. Suppliers can demand a bigger slice because they are much harder to replace. GM may want to tell Continental to take a hike, but without the in-house capability to develop new components plus make them around the world, GM has little choice but to give when Continental asks for more. Even without increased bargaining power, suppliers can make more than assemblers because in many ways they face an easier operational problem. One reason for the disparity is that carmakers are at the mercy of customer demands and tastes – requiring billions of dollars of annual investment in new designs – while component manufacturers need only make small adjustments to parts to maintain a steady revenue stream. In many ways, this is the most interesting nugget in the whole article. Not only have parts suppliers managed to gain some bargaining power over assemblers, they have also managed to minimize their exposure to risk. Yes, they still face risk on the general level of demand but they can be much less concerned about the mix of what is selling.